Since the onset of the North Bay wildfires, we have reached out to all of the Jewish communal organizations in our service area, in concert with the East Bay Federation. This post is part of a series of first-hand accounts from the Federation staff and our partners in the affected region. The reflection below was co-authored by the Federation’s Danit Trau and Jason Harris. 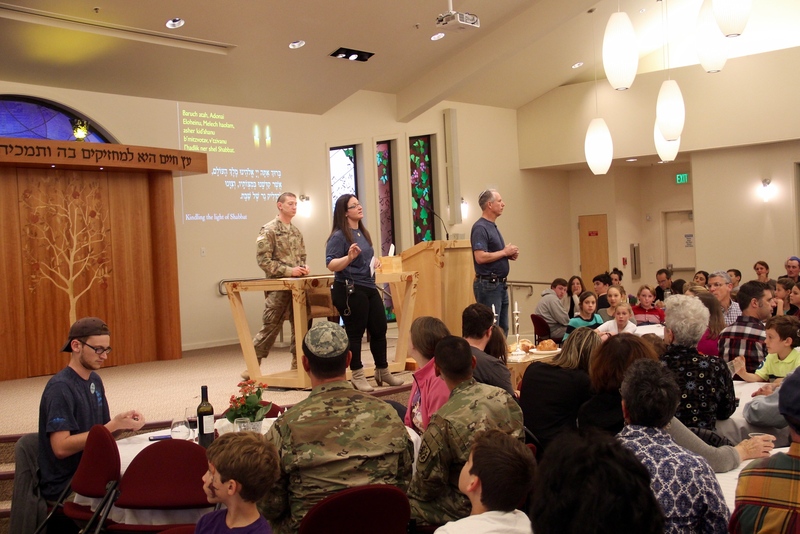 There was a profound need for a communal Shabbat in Santa Rosa this past Friday. The Congregation Shomrei Torah community has weathered the brunt of the local wildfires. More than two dozen families have seen their homes go up in flames, and the congregation lost their beloved past president. Amidst this incredible suffering, the synagogue has been serving as a hub to meet the community’s immediate needs, including offering daily lunches and a day camp for children, as well as free massages to help manage stress, household supplies, power, water, and internet access. Shomrei Torah’s stellar staff were supported by organizations like Jewish Family and Children’s Services (JFCS), IsraAID, URJ Camp Newman, Camp Tawonga, and the Bay Area Jewish Healing Center, as well as the Federation. 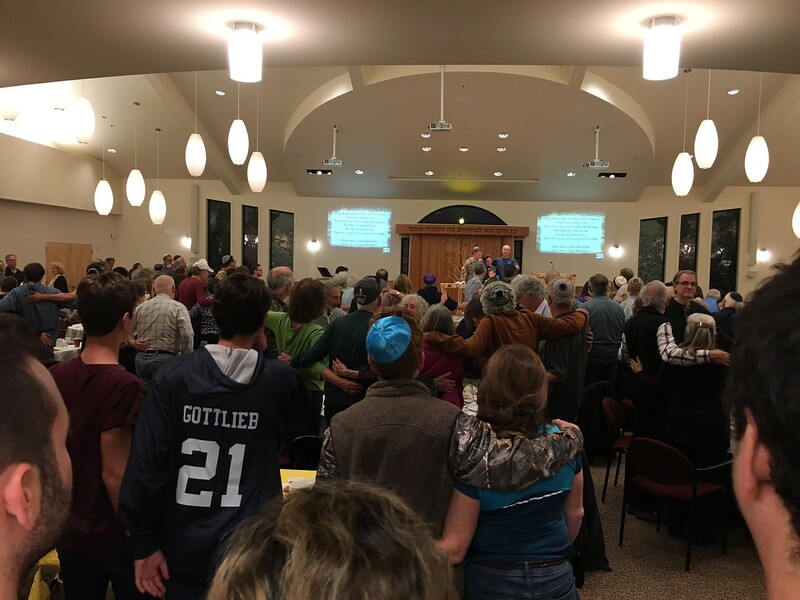 On Friday, the Federation staff, with the support of Moishe House, Wilderness Torah, and individual volunteers, helped Shomrei Torah organize a solidarity Shabbat after the devastating week. 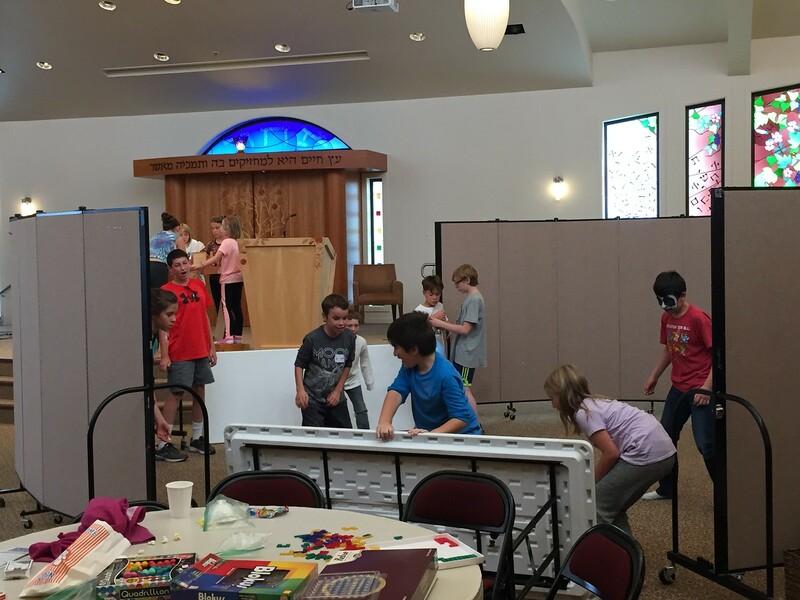 Inside the synagogue there were tables stocked with toiletries, face masks, and toys; the kitchen had been turned into a makeshift food pantry with dry goods stacked in every corner for the taking – all donated by local individuals and families to others in need. 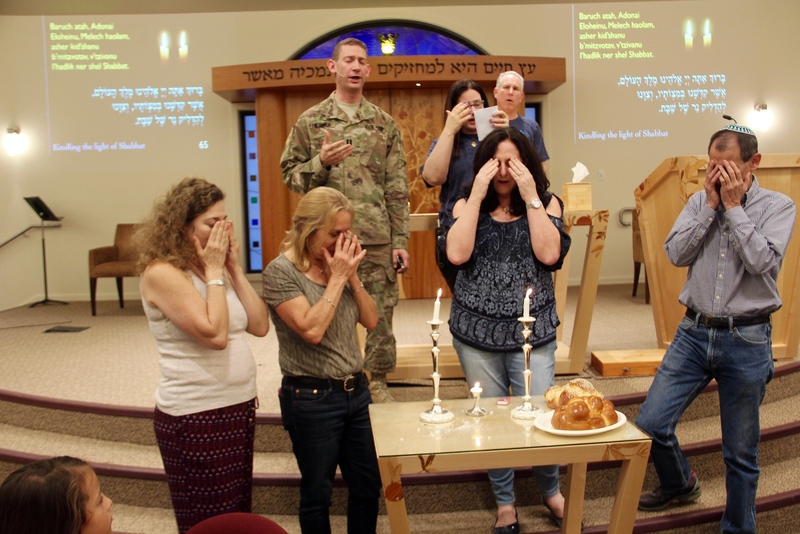 While Jason and other Federation staff made calls to congregants to check on their status and invite them to Shabbat, Danit connected directly with community members using the synagogue as a gathering place. She went into the main sanctuary which was turned into a day camp, outfitted with a bounce house, makeshift Ga-Ga pit, a popcorn station, arts and crafts, and plenty of staff and volunteers (especially from IsraAID) entertaining the kids. 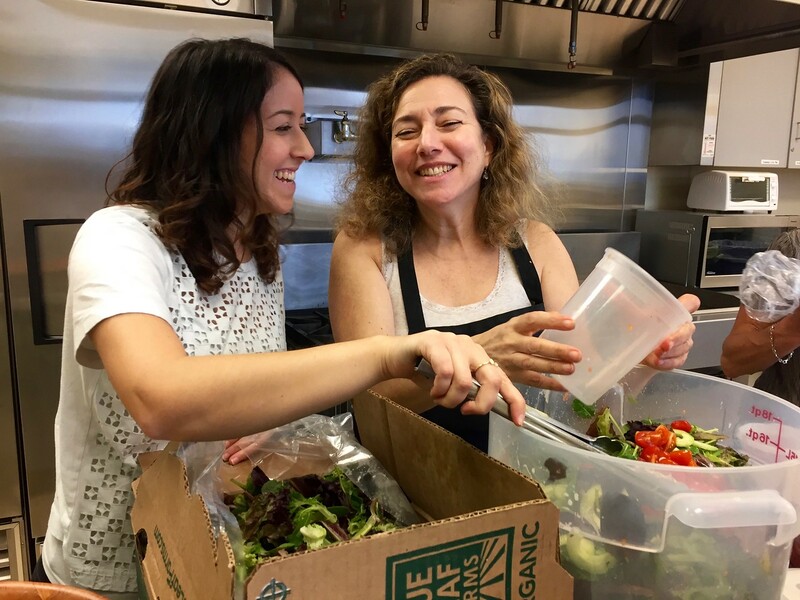 When camp ended, the volunteers rallied to turn the sanctuary into a full-service dining hall. We were told to expect 100 congregants to attend. As the sunset’s smoky yellow glow permeated the sanctuary windows, the community arrived in earnest. The extra tables we set aside filled up. Then the extra chairs. After that we had to break down some of the serving areas to reclaim more tables and chairs. The congregants kept coming. In the end, more than 250 people attended. The congregation, even those who had lost their homes, took the time to share their deep gratitude with all the volunteers. The buffet line meant more than just spooning food onto people’s plates – some sharing their stories, others listening; people trying to put on a brave face, many tearing up. In a cramped space with pasta running low, the falafel gone too quickly, and children helping themselves to extra cookies, it was Shabbat in action. Shabbat comes every week – always returning and never going away. And neither will we. We are always there for one another with local agencies never failing to show up. Whatever the loss, together, we will help recover, relieve, and rebuild. Danit Trau is an associate program officer for the Federation’s Israel & Global Network. Jason Harris is the Federation’s Birthright Experience program manager. Currently, funding remains the greatest need, and we ask that all who are able, to please give as generously as you can to the Federation's North Bay Wildfire Emergency Fund. If you are looking for wildfire resources, or information on how you can help, view our blog. We will continue to update this post as more news develops.